Empty chairs. Why did they even unfold them? Some of the lights are out. Some of the lights are inconsistent. The one above your podium is flickering. Does anyone care? Can someone take care of this? “Have you heard of this guy?" they whisper. "Has he been published anywhere noteworthy?" It’s time for you to speak. It’s five minutes past time for you to speak. The entrance doors still swing. A person or two still in the lobby. Palm sweat stains your notecards. You thought you’d be established by now. "We can’t hear you," says a deep voice through cupped hands. "How long is this guy talking for?" Noah Gammell is an upstart writer, casually laid-back in the hills of Western PA. His work has appeared in Elimae. 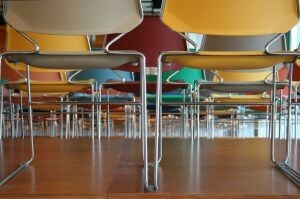 Photo "Chairs 2" courtesy of Anka Draganski, London, England.